Tea Time Necklace Set comes with 3 beautiful blooming flower relaxing teas in a green miniature tote bag.Tea Time Necklace Set is also complemented by a small pack of aromatic insense sticks and candle. 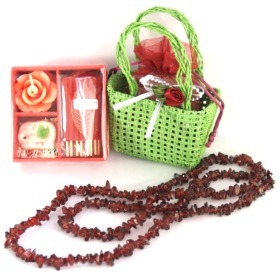 Not only that the gift set also come with handmade beaded stones necklace. A beautiful piece.